Should students know their CPA as well as their GPA? Reporting on work done at KIPP Academy middle school in South Bronx (mostly students from low income Black and Hispanic families) and the Riverdale Country School (tuition starts at $38,500 for kindergarten), Tough shares a list of character elements the two schools chose as a focus. These seven were chosen from a list of 24. When asked if these traits can be taught, Tough answers, “I do think they can be taught in the classroom – I think most of us can think of a teacher in our past who helped us develop one or more of those skills”. You can view a panel discussion with Tough and others from the book here. NBC News Education Nation: Can Character Be Taught? Reading that quote, I found it interesting (based on my recent blog about working or learning) that Duckworth didn’t say learning is “hard work”…. learning itself can be hard. To be successful you need to learn how to fail. This past week I was engaged in a discussion about grading with high school teachers. 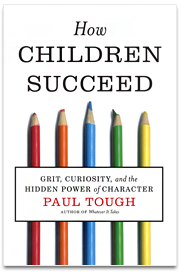 One conversation concerned whether character (effort) should be included in assigning grades. The struggle is that teachers want to recognize and applaud effort yet know that in a grade it confuses the clarity of the academic standard achieved. Perhaps a character report card, or profile, or at least conversation could be a solution. I believe discussions identifying character traits teachers wish to develop (and how to develop) are worthwhile coaching, PLC, or faculty development activities. I was watching 60 minutes last night. Two gentleman were interviewed who were responsible for hiring at a Midwestern manufacturing plant. They claim they have jobs waiting to be filled, but can’t find skilled workers. Asked to define skilled workers, they said they needed workers with good math and problem solving skills. More importantly, they needed workers with a good work ethic-arriving on time, willing to be present and excited about working. These are character traits they look for in those applying for a training program offered by the community college, designed to have workers ready for jobs at their plant. In an article I read in Education Week, dated October 24th, Haut Gap Middle School in Charleston, SC, is teaching a 40 minute/day class for 9 weeks for students who”need extra time to nail concepts such as how to own up to mistakes, accept feedback, and apologize appropriately (Positive Behavioral Interventions- PBIS)The school reports that with this course, suspensions have decreased dramatically. This supports Steve’s blog’s statements that character skills can be taught and produce positive outcomes, especially job possibilities. We can make the argument that these are essential career ready skills we can’t ignore.